Whilst teak garden furniture requires regular oiling, our metal garden furniture is maintenance free and requires no staining or oiling. It is also a better choice than iron or cast iron garden furniture as it does not corrode and rust. Lazy Susan metal garden furniture is designed to be left outside all year, unlike wooden patio furniture which is best stored inside over the winter months. 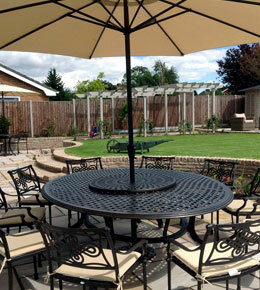 Aluminium garden furniture can be left in place year round and will not clutter up your garage. 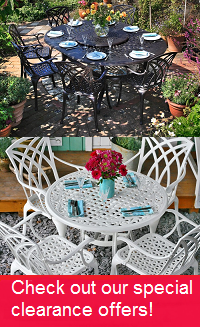 All our metal garden furniture is made from premium grade virgin aluminium with a highly durable powder-coated finish. The coating is protected against ultraviolet ie. sunlight. However, like a new car you must expect some gradual fading over the years, this is likely to be indiscernible, but we would like to point out that all aluminium patio furniture sets will do this. You can refresh the look of your furniture by applying some baby oil on it. The metal garden chairs Jane, Mary, and Maria, and all of our chairs from the modern range (Abigail, Georgia, Lea, Milly) are designed to stack. Special attention has been paid to the design of the back of the chair to make them really comfortable, with or without cushions. The larger round and oval metal tables have a lazy susan which allows you to pass items around the table simply by rotating it. The aluminium lazy susan simply sits on the table top and has a central hole for the parasol. As a small business, all telephone calls and emails are answered by Michael and his dedicated customer service team, allowing for a fast and informed response to any queries over prices or delivery options. Queries can be resolved immediately without being shunted around different departments. Lazy Susan Ltd prides itself on its prompt and efficient customer service. As a small business, our overheads are low. Lazy Susan does not run an expensive shop, though customers are very welcome to visit our showroom in Chichester, West Sussex. Because Lazy Susan Ltd specializes solely in metal garden furniture, we are able to buy in large enough quantities to achieve very competitive cost prices from our suppliers and we pass these cost savings directly to our customers. As a result, we are able to keep our prices really low. Seat pad cushions, which cover the chair seat only, are available in Stone, Apple Green, Navy Blue and Terracotta. All of our cushions including those for the Benches have been purpose designed for the Chairs and Benches so they fit really well. The cushion pads are quite thick 5cm and therefore very comfortable. The Covers can be unzipped and washed, this means that your cushions will last a good few seasons. No need to assemble any of our stacking chairs (Jane, Mary, and Maria, and all of our chairs from the modern rage) as they are all assembled and welded at the factory. They just come straight out of the box and onto your Patio. It only takes around 8-10 minutes to build our self-assembly chairs. If you need help, please see our videos on the Assembly Instruction page. Unfortunately, we can’t, but please refer to our Assembly Instruction page. 4 and 6 seater tables only take around 30 minutes to put together, 8 and 10s around 40 minutes. Lazy Susan Ltd offers an automatic one year guarantee for any structural defects. In the unlikely event of there being a problem, we will replace the damaged part within 7 days (subject to stock availability). What can I track my order?